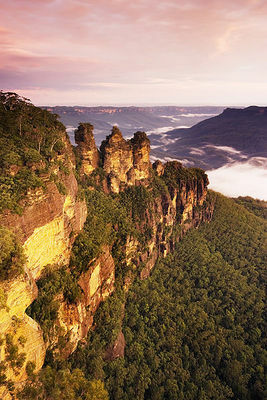 The Blue Mountains are one of the major attractions in the Sydney surrounding area. It is easy to get there by train from Central to Katoomba, but once there it might be difficult to walk around, due to the extensive nature of the national park. The Blue Mountains Explorer Bus is a good option for those who enjoy hiking but who want to see all the major attractions in the area in one day. The bus runs in a circular circuit every 30 minutes and allows you to hop on or hop off at any time depending on which places you are interested in. The bus not only stops in natural places such as the Katoomba Falls or The Three Sisters, but also in the town or other shopping or restaurant spaces. A good route is from Echo Point through the Three Sisters by climbing the giant stairway. The walk is adapted to all fitness levels, so it would be a perfect idea for families with children. In addition, this gives you the chance to get a magnific snapshot of the iconic Three Sisters. The tickets cost $36 for adults and $18 for children and can be purchased both at the train station in Sydney and the bus office in Katoomba.